The Midwest whitetail inhabits the central regions of the US from Colorado to Minnesota. For a reasonable chance at a trophy-class Midwest whitetail buck, there are few secrets. Midwestern states like Iowa, Illinois, Minnesota, Missouri, and the like dominate the conversation. Then there are the outliers such as eastern Colorado or northern Oklahoma. Of course, you can’t rule out the Canadian provinces of Alberta, Saskatchewan, and Manitoba, which produce some real studs each year. The state where I have done most of my serious trophy hunting the past several years is Kansas. It’s no secret that Kansas in general, and the eastern half of the state in particular, produces a goodly number of really big whitetail bucks every year. Here the excellent farm country habitat and superb genetics, coupled with a rifle season lasting less than two weeks, helps the deer get enough age on them to reach their full potential. I have hunted a fair amount in the region, and like it a lot. However, for nigh on a decade, the southwest corner of Kansas is my own little “secret spot” for a chance at gold medal, free-ranging whitetails. At first blush this may seem strange. The terrain here is mostly rolling sand hills, sagebrush, and tumbleweeds, with little visible water and scattered agricultural efforts. Most of us would look at it and think it more suited to mule deer — which live here, too, and can get really big. But, it is the whitetails that keep drawing me back. Several years ago I hooked up with Jeff Louderback, who lives in Liberal, Kansas. Jeff is a real cowboy, having attended college on a rodeo scholarship. He’s also a hard-hunter who used to guide for one of the West’s biggest outfitters. Jeff and his dad — a Purple Heart recipient from the Vietnam War — have owned their ranch land, on which they have run cattle, since 1969. Together they own approximately 50,000 acres, with bowhunting-only allowed on 8,000 acres of prime river bottom. The gun hunters work the sand hills adjacent to the bottoms, which includes a 3,000-acre plus “sanctuary” owned by the city of Liberal. On top of everything else, in 2011 Louderback opened Hunters Warehouse in Liberal. It’s a full-service archery and gun shop through which Jeff, a certified firearms instructor, offers a wide variety of shooting and self-defense classes. In short, he knows hunting, his land, and knows how to offer his clients, both archers and riflemen, the best possible opportunity to shoot old, mature Midwest whitetail bucks. The southwestern side of Kansas is kind of a hidden secret for a big Midwest whitetail. Here there are fewer people and more open land than areas of central and eastern Kansas, and the deer quality continues to grow year after year. This area is mostly sagebrush-covered plains country with scattered river bottom cover featuring lots of agriculture up off the bottoms, including corn, winter wheat, and alfalfa. The key for deer hunters is that the local deer herd has both the genetics and the opportunity to grow bucks old enough to produce big antlers. That is most evident when you talk to local deer hunters who say a 150-inch buck is “a nice one,” but they do not really get excited until they see one over 170-inches. They call a “shooter” a 150-class buck or better for gun hunters, with a 140-class buck a shooter for archers. That’s high-quality deer hunting! For five of the past six seasons, I have hunted Kansas with Jeff. On my first hunt in 2007, I had a drop-tined monster get away from me only to have a 7 1/2-year old 12-pointer that scored 164 2/8 Pope & Young points walk 22 yards from my stand before my Thunderhead destroyed his pump room. Three years ago, I chose to bow hunt the bitter post-rut of mid-December, after the gun seasons were over but when bone-chilling cold forces bucks worn to a nubbin from the rigors of the rut to eat a lot — and that means head for the high-calorie food sources. I didn’t let an arrow loose — but that wasn’t because I wasn’t seeing anything. To the contrary, I saw scads of deer and numerous mature bucks, but was holding out for one of the true monsters I kept seeing, but wasn’t able to get a shot at. In 2009, I returned together with my friend, Mike Strandlund, of Minnesota. We experienced a tremendous deer hunt, with Mike taking an ancient 7 1/2-year old 10-point we scored at a gross 157 7/8 gross Pope & Young points. Another good friend, Steve Sam, of North Carolina, killed a buck grossing 154-inches P&Y, just before we arrived. I ended up hunting for myself after the rifle season closed in early December. On a bitter day with the mercury stuck at -4 degrees, I shot an old, 6 1/2-year old buck with an 8-point frame and one small extra point on the right (the same point had been broken off on the left) that measured 154-inches P&Y. In 2011, the hunting was tough, as a severe drought dried up the local food sources and the deer were cruising more than usual. Still, I managed to shoot a buck with a body weight of well over 250 pounds and a 9-point set of antlers that scored a tick under 160-inches P&Y. Last year was more of the same drought-hardened conditions, but, Steve Sam, came through with his biggest buck to date, a 160-inch 9-pointer. I shot a 145-inch buck with a 10-point mainframe that had broken his left G-2 and right G-1 completely off. Now, I am not saying there are bucks like this in every place in the region. There are plenty, to be sure, but hunting them is not easy and the deer density is nothing like it is further to the east. But, there are pockets where the hunting can be really good. Like everything else, it takes some research and trial-and-error to find one. One of the things I like about bowhunting Kansas whitetails is that the season is extremely long, running through all phases of the rut with a short break during November for the gun season. In addition to hunting the rut, I like to hunt late in December, when bitter weather drives the deer to food sources and they can be patterned. 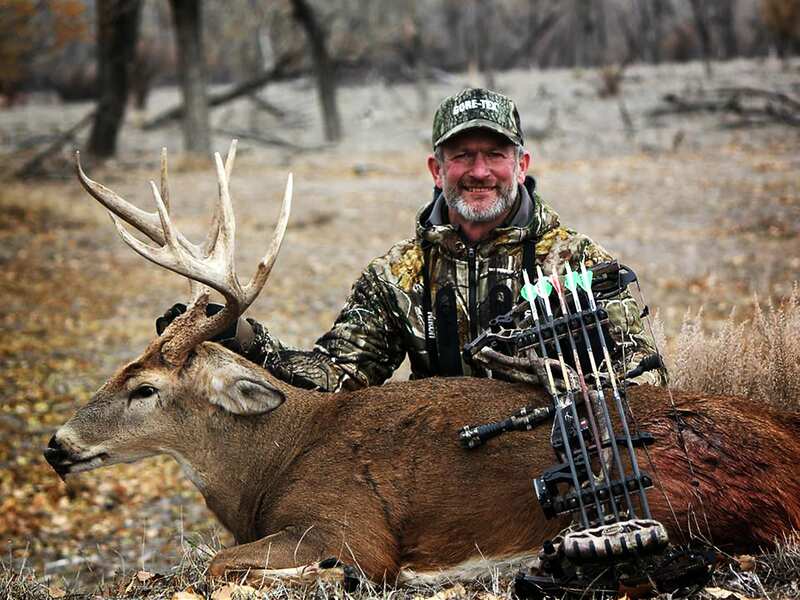 Southwest Kansas may be on the far edge of the Midwest, but it is certainly a place where the dedicated whitetail hunter can find a true whopper Midwest whitetail buck. I don’t know about you, but when I see antlers that take my breath away, I really am not too concerned about the aesthetics of the neighborhood! For more information on Midwest whitetail deer hunting in Kansas, visit https://ksoutdoors.com/Hunting.